Interior Size: 1636 sq. ft. 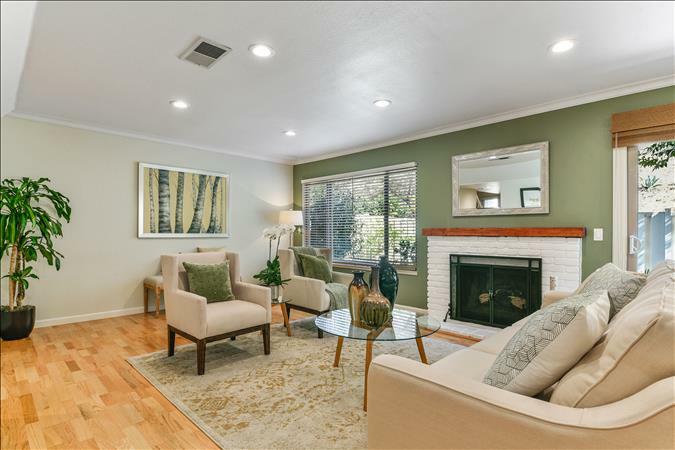 Located on a cul-de-sac, this lovely remodeled townhouse offers a spacious open floor plan. The large living room/dining area features a fireplace and windows and sliding door to the garden. The remodeled eat-in kitchen includes a gas cooktop, stainless appliances including a refrigerator. All baths have been remodeled. 3 bedrooms, 2.5 baths featuring a master suite with vaulted ceiling and 3 closets! Step out to the garden – enjoy the peaceful setting – a great place to chill after a hectic day. 2 car attached garage with inside entry. Community pool. Near the Regional Park and equestrian center yet minutes to the freeways connecting the business centers of the bay area. The homeowner’s dues of $435 per month include earthquake and fire insurance on the structure, most exterior maintenance including the roof, use of the pool, management and private security patrol.